'chosen ones' with the Holocaust™/anti-Semite card© are the biggest anti-Semites on Earth, by a long shot. Someone needs to tells those fucks that most Semitic people speak Arabic. Most Zionist Jews are not "Semites" themselves so my suggestion is they all take a DNA test before they start touting their Semite Cards. Every single Palestinian and Arab is a Semite yet we don't see them doing the same now do we? Zionist scum are being exposed daily and it hurts when they get burned so instead of screaming "Ahhh" they are instead crying out "Ahhhh-nti Semite!" finally other people that understand, Zionists, and the Jews living in Israel aren't semetic, the palestinians are, so the worlds most anti-semetic country is by default ISRAEL. Let them keep going, too many people see through it now. When they actually, according to the white house briefs, declares questioning the actions of the state of Israel as anti-semetic, I think a lot of people clued in. 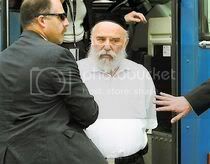 The feds bust a fraud ring that happens to involve several Rabbis? You ask questions regarding the dancing Israelis on 911, the ones later interviewed in Israel admitting "we were there to document the event, and we did" so asking how they knew the event was going to happen? What about odigo, and the IM warnings the Israeli workers got at the WTC warning them not to go to work that morning? Asking why on earth they would block food and medical aid from going into Gaza? Asking why they continually attack each and every arab country that borders them? Asking why a country born from the holocaust has taken it upon themselves to launch a holocast against the people of Gaza? Questioning the role of Zionism, and condemning the actions of the blood thirsty Zionists? Condemning the us of banned weapons like DIME and White Phosphorus against the people of Gaza? condemning their targeting of red cross and un workers/buildings during Cast Lead? And it gets better. the IDF soldiers that told us what they did in Gaza? they are Israeli's, and Jews, and guess what, they are anti-semites. It's asstarded, We're mad as hell, and We're not going to take it anymore. Remind me again, what's so terribly wrong with being anti-semite? anyone who is informed and not indifferent, becomes one inevitably. Jewish community worldwide for decades has been on constant path of crimes, lies, espionage, false flag operations, character assassinations and similar; what else do they expect? At one time, the term 'anti-Semitic' was a type of curse hurled upon someone. These days, it's starting to look like a Badge of Honor. Guess Zionists and Israel never heard of the tale of the "Boy who cried wolf." Clearly not all criticism of the state of Israel is necessarily "anti-semitic". However, do you concede genuine anti-semitism exists? For example, in the same way racial prejudice against blacks exists? Would you also concede that when you suggest all criticism of Israel is wrongly accused of being anti-semitic, you are functioning to provide a protected space for anti-semites to attack jews free from legitimate denunciations of "anti-semitism"? To clarify: nazis and fascists will attack Israel entirely because it is a jewish state - because of the Nazi belief in a Jewish world conspiracy. Would you accept such critics are genuinely "anti-semitic"? Unfortunately the Zionists have committed so many crimes that even if you weren't anti-semitic they make you become one.If you stay informed then you will become an anti-Israel which equals anti-semitism which equals hating jews. "the nazi belief in a jewish world conspiracy"
LOL, obviously you don't know about the talmud. Sue and Gr1mreaper both seem to speaking to me, but they're avoiding the points I raised. I accept nobody is beyond criticism - not all criticism of Israel is necessarily anti-semitic. However, anti-semitism means "jew hate" - as distinct from "criticism of Israel". I asked if you can acknowledge that Nazism and fascism use "criticism of Israel" as an excuse to express their hatred of jews.... It seems gr1imreaper and Sue cannot. Claiming all accusations of anti-semitism (jew hate) are driven by a desire to protect Israel from legitimate criticism serve to defend the jew-hate of Nazism and fascism. It creates a space for nazism and fascism to operate. Unless you are willing to make such distinctions, and to recognise such a reality, there is obviously legitimate concern that your "criticism of Israel" is actually serving fascism, and is in fact "jew-hate" ie anti-semitism. So, do you recognise that anti-semitism (jew hate) exists, and that fascism and nazism can flourish in a situation where people such as yourselves claim "anti-semitism" is only used to describe legitimate criticism of Israel? Do you recognise such a position as yours serves to protect Nazis from the legitimate accusation of anti-semitism? Does genuine anti-semitism exist? Anti-Semitism does exist, but it is overshadowed by Israel and her Zionist backers using that term to cover up any and all crimes committed by that Apartheid nation. The same goes for Jews here in the USA that get caught stealing money or conning it out of people. There's been trillions of dollars looted out of Wall Street, some of that money MADOFF to Israel. But don't look too deeply into what happened or you'll be labeled as being anti-Semitic. As for you trying to equate legitmate criticism of Israel with Nazism, that's just a distraction from the point of this blog. The question is, what is a jew? someone who follows the 10 Commandments? someone who follows the babylonian talmud? someone who belongs to a supremacist mafia? someone who is descended of a family member who at one time or another belonged to one of the VARIOUS tribes who converted to judaism? What you must realise is that 'jew' was never a race from the very start, only a collection of tribes that claimed to be special, and acted accordingly. In fact, they weren't even called 'jew,' which is a made up term, unless you consider Judean, and in that case, it is the Palestinians, and Arabic peoples who are closest in relation. Therefore the population with the most "anti-Semite nazis" is among the 'jews' themselves, and like the guilty criminals they are, they always point the finger at everyone else for noticing. You seem to be saying there's no such thing as "jew", but nevertheless "the most "anti-Semite nazis" is among the 'jews' themselves, and like the guilty criminals they are, they always point the finger at everyone else for noticing." So "they" don't really exist, but "they" are all criminals anyway? And look at the earlier comments - very easy to make a case that what's driving these comments is simple anti-semitism ie jew-hate. There's almost no effort to avoid it. Jews this, jews that, mixed in with zionist this, and israeli that. If you can't distinguish then you deserve the label anti-semite ie jew hater. And you're just hiding your hate behind the claim that ANY criticism of Israel is called anti-semitic. Easy claim to make - but one the comments here totally fail to justify. Let's put "blacks" instead of jews? Or Christians? J: what's so terribly wrong with being anti-black? anyone who is informed and not indifferent, becomes one inevitably. Black community worldwide for decades has been on constant path of crimes, lies, espionage, false flag operations, character assassinations and similar; what else do they expect? Yes - so very enlightened, eh? At one time, the term 'racist' was a type of curse hurled upon someone. Yeah - fantastic stuff Greg. Greg: The same goes for blacks here in the USA that get caught stealing money or conning it out of people. As another example - where is the similar condemnation of confirmed and persistent Chinese organ removal of prisoners etc? Where is your denunciation of that? Nowhere, right? HEnce, your choice to denounce Israel alone is effectively anti-semitic, because you willingly lay into jews for the same things which you ignore in other groups. That's definite anti-semitism. YOur cries otherwise are hollow.